This design is an abbreviated illustration of the famous encounter between Minamoto no Yoshitsune, the most courageous and chivalrous hero of the late 12th-century civil wars, and the warrior-priest Musashibō Benkei. Having been told that he needed the tempered point of 1000 swords in order to make a fine sword for himself, Benkei set out to ‘collect’ swords from warriors who crossed the bridge at Gojō (‘Fifth Avenue’) in Kyoto. When the unsuspecting teenage Yoshitsune came along, Benkei attacked him but was comprehensively beaten, as Yoshitsune had studied martial art with the legendary 'tengu' and was endowed with supreme powers. 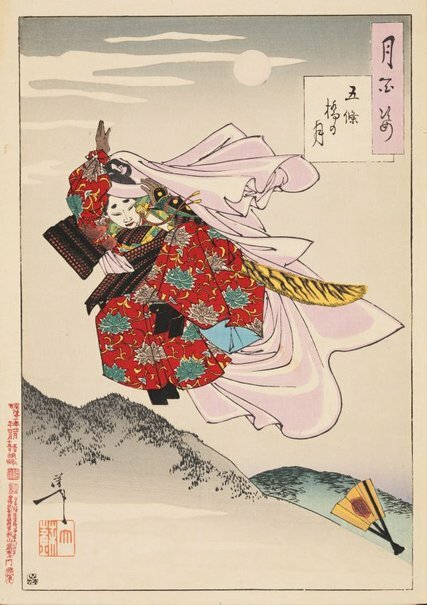 Yoshitsune is seen here leaping effortlessly into the air to escape Benkei’s attack.